NASA astronaut Scott Kelly is seen during a spacewalk outside the International Space Station on Nov. 6, 2015. He and crewmate Tim Kopra will likely perform a surprise spacewalk on Monday, Dec. 21, to repair the station's stuck Mobile Transporter. Astronauts on the International Space Station will likely take an unplanned spacewalk next week to fix a stuck railcar used by the orbiting lab's robotic arm, NASA officials said today (Dec. 18). The surprise spacewalk could occur as early as Monday (Dec. 21) and would send NASA astronauts Scott Kelly and Tim Kopra outside the space station to free the outpost's Mobile Transporter railcar, which stopped moving on Wednesday (Dec. 16) while under remote control by flight controllers on Earth. The problem must be fixed before the arrival of an unmanned Russian Progress cargo ship on Dec. 23. The space station's Mobile Transporter is a rail-based platform that runs much of the length of the space station's main truss, allowing the station's robotic arm to reach most of the orbiting lab. Right now, the railcar is just 4 inches (10 centimeters) from its intended latch point — near the center of the station's main truss — where it can be securely locked into place and powered ahead of the Progress cargo ship arrival. The robotic cargo ship, called Progress 62, is scheduled to launch toward the space station from Baikonur Cosmodrome in Kazakhstan on Monday at 3:44 a.m. EST (0833 GMT). It is due to dock itself at the station two days later, on Dec. 23, at 5:31 a.m. EST (1031 GMT). In a NASA TV interview, Todd said engineers will evaluate the stuck railcar and devise a plan to free it over the weekend. The space station management team will meet on Sunday (Dec. 20) to decide whether to go ahead with the spacewalk on Monday, or push it to Tuesday (Dec. 22). 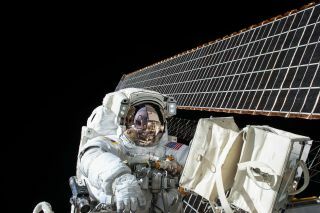 NASA will televise the spacewalk live. The spacewalk repair should take up to 3.5 hours, Todd said. The surprise spacewalk next week will be the 191st dedicated to space station assembly or repair. It will also be the third career spacewalk for Kelly and the second for Kopra. The space station is currently home to six crewmembers: two Americans (Kelly and Kopra), three Russians and British astronaut Tim Peake, who represents the European Space Agency. Kopra, Peake and cosmonaut Yuri Malenchenko arrived at the space station on Tuesday (Dec. 15). They joined Kelly and cosmonauts Mikhail Kornienko and Sergey Volkov, who were already aboard. Kelly and Kornienko are in the midst of a yearlong space mission that will end in March.